Fall colors at the Edwin B Forsythe National Wildlife Refuge have not been as vivid this year as in the past, mainly because of sparse rain during the summer. Still I tried some landscape shots to see how they would turn out. 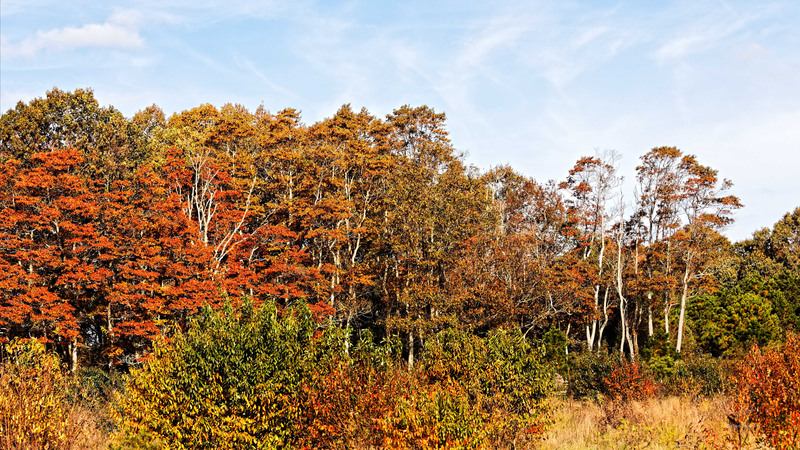 Fall colors at Edwin B Forsythe National Wildlfie Refuge. 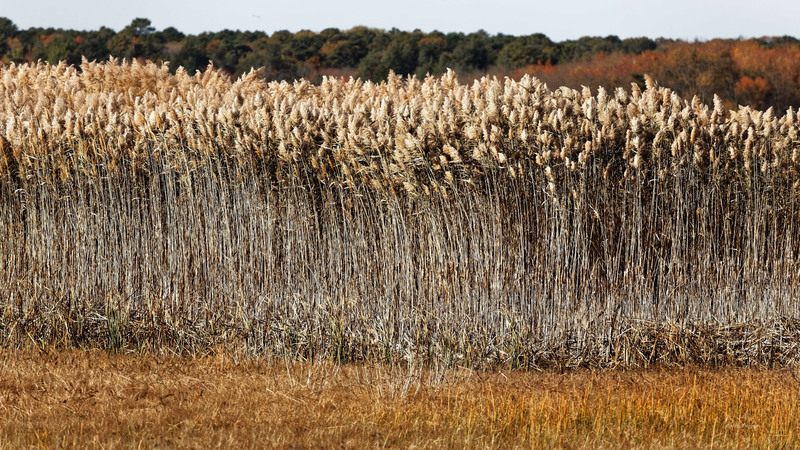 Phragmites, an invasive grass, did very well this year, with widespread stands of dried tall grass in many parts of the refuge. I had to to dig out of my archives the following sunrise shot of the refuge taken four years ago in September. Things looked prettier then. Sunrise at Edwin B Forsythe National Wildlife Refuge. That sunrise could make up for anything! It was the best sunrise I had ever seen, and worth getting up early for it. Looking at it again, I like the light on the grasses in front, and the water towards the back. It would be a good one to print and frame. Wonderful post with lovely autumnal colours and magical Eos lighting painting the skies!Stunned by your second photo with the invasive grass,never have I seen such a grass species with extremely tall stems! Thank you Doda! The refuge did not cut the grass this year, letting it grow freely. They will have to do something before it takes over everything. 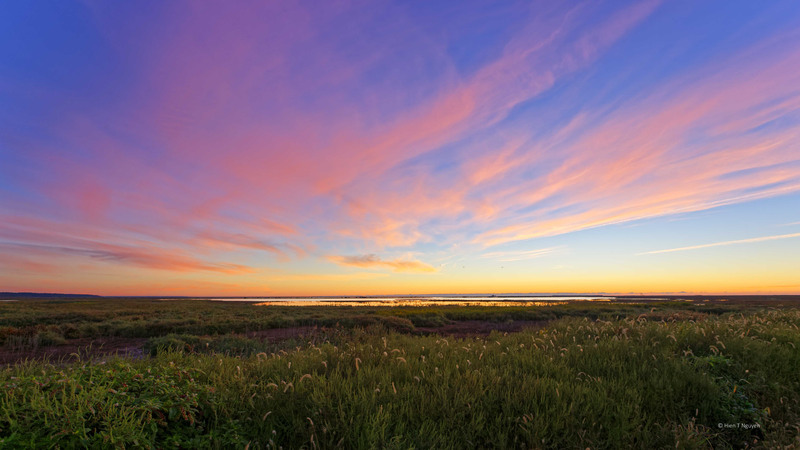 Your sunrise capture is stunning, Hien, I love it! Donna, I was really lucky that morning. The sky was mostly pink. I’m glad that some one saw some terrific fall colors, and you certainly did! Simply gorgeous Hien-san. I admit, I like the “dried invasive grass”…. Takami, that dried grass is said to kill other vegetation. Sometimes it even has to be burned, but it keeps coming back year after year. Ah yes…we have the same challenges here too. I am surprised about the dried invasive grass. Why are they allowing it to go to seed? I was wondering the same thing. This year the refuge people left the grass grow taller and taller, without trying to cut it. Your sunrise picture is spectacular! >> …mainly because of sparse rain during the summer. I didn’t know that! I thought it was solely depending on the weather in early fall. No wonder our maple tree didn’t do as well as before (still better than some years). We had a good weather in early fall and I was expecting one of the best fall color from the tree; I couldn’t figure out what went wrong. A lot of people are disappointed this year about those fall colors. Wonderful, even minus the sunrise. What a difference. Beautiful photos of dried invasise grass. Thanks Amy. That dry grass (or reed) was really striking and I knew I had to get at least one or two shots of it. Fall is a magical time of year in the northern climates. It’s one of the reasons we wait until November to head to Arizona. That’s a good idea to wait until the weather really changes!